A native of Ohio, Karin Wraley Barbee currently teaches composition and creative writing at Siena Heights University. She lives with her husband and two children in Adrian, Michigan. 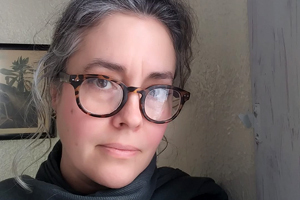 Her work has appeared in Natural Bridge, Swerve, Fjords Review, The Diagram, Columbia Review, Whiskey Island, Found Poetry Review, Glass: A Journal of Poetry, Your Impossible Voice, and Sugar House Review.